Having kids was by far the greatest challenge I have had in my life. I normally live for challenges, but becoming a 24/7 service worker after a lifetime of freedom was more than I could deal with. This blog is part of my project of finding back to who I am. My parents gave me the travel bug during early childhood. After spending the childhood traveling in Asia, living in the Middle East or venturing deep inside the African Savannah the world will never be the same. Once a traveller- always a traveller. With the age of 14 I was discovered by a model agency, and two years later I was already living and working as a model in Milan. I followed by moving to Paris after high school, and travelled the world going on photo shoots. But around the time I turned 20 I was depressed. I realized it was the job as a model that was the culprit. It was too superficial. It was not in tune with what I valued in life. Instead of living up to other peoples expectations I wanted to be true to myself, so I quit modeling. The following year was spent in South America working as a volunteer in the slum of Quito, Ecuador, and backpacking around the continent. I continued backpacking through Asia and combined traveling with my bachelor degree in Social Anthropology and Human Geography. These subjects were great ways of justifying my travels. I finished up my Bachelor with a semester in Costa Rica, and followed up by traveling north through Central America. Next stop was Florida for a few months of skydiving. 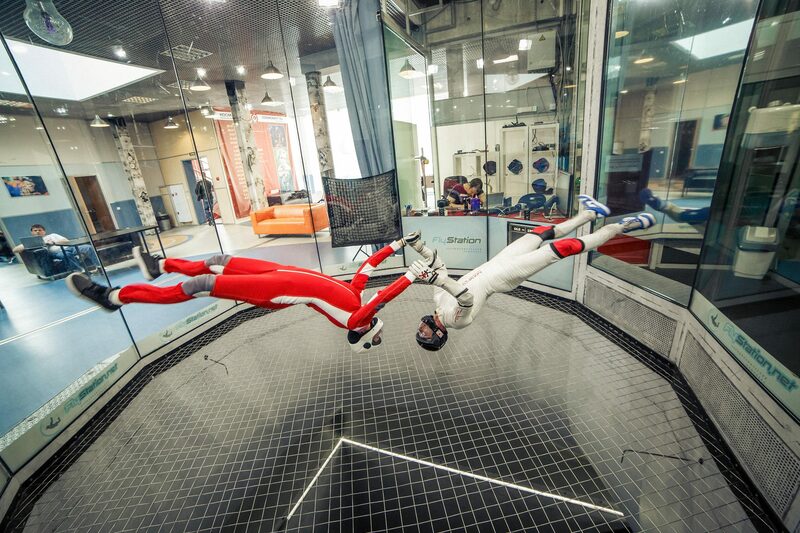 I had been skydiving since I was 18, but due to my globetrotting I hadn’t had much time to focus on it. I wanted to work up a better skill level. And then I discovered base jumping, and got hooked. I did my master degree in Human Geography specializing in Development- and Urban Studies. In the middle of this I took a semester off from University to work as a model again in Hamburg. All my savings from earlier years were spent, and I had grown older and could keep an emotional distance to this job. It was just an extra income, not a lifestyle like before. Part of the master degree in Human Geography involved doing fieldwork, I chose Venezuela. Here I had friends from earlier travels, and I could fulfill my dream of base jumping from Angel Falls. But I fractured my ankle on a skydive during the first month there and ended up spending the remainder of the 6 months jumping around on crutches. I managed to do my field work where I compared a slum upgrading program in two slums in Caracas, but there was no base jumping. This event was a turning point in my life. Opposite of what everybody else would have thought it made me realize how important jumping was to me, and that I wanted to do it full-time. 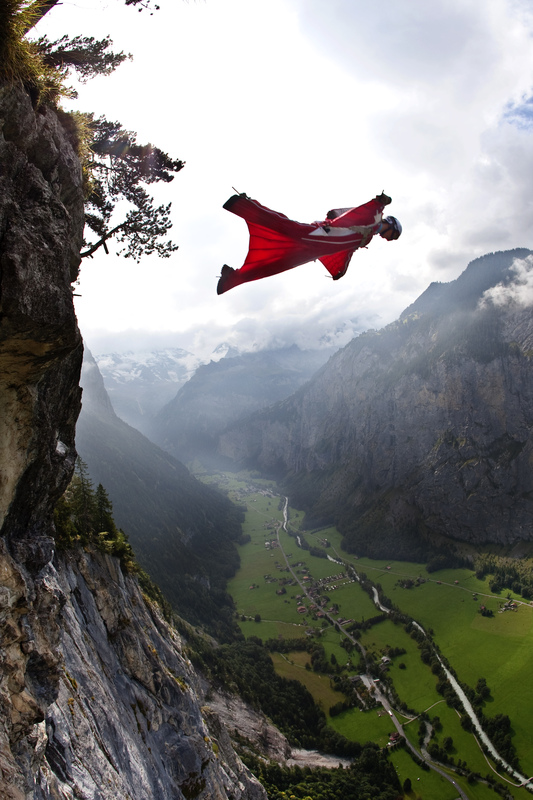 But base jumping and skydiving are time consuming sports. If you want to be good at them, not to mention safe, you need to invest time and energy. 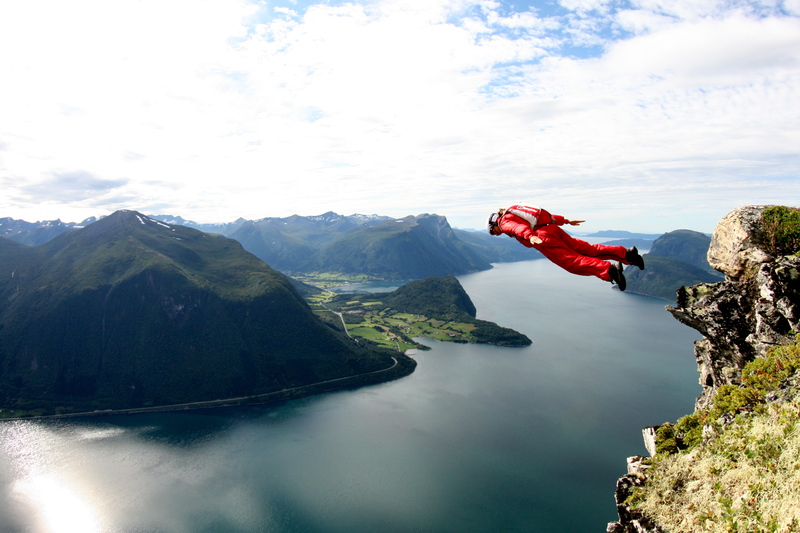 Returning home, I spent all my spare time base jumping around the mountains of Norway and Europe. But before I finished my master degree I worked as an intern with the UN in Kenya, a place I also found a cliff to jump off. And here I fractured my second ankle! Now I was more determined than ever to base jump. I finished my master degree, jumped as much as I could, and at the same time signed a sponsorship agreement with Berghaus Ltd. In 2006 I got a job in Pakistan with The Norwegian Refugee Council helping the supply of shelter after the big earthquake. I lived close to Abbottabad (where Bin Laden also lived) and used to go there often after work to base jump off what looked like a home made cable car crossing a valley. Wonder if he heard of me?! The crazy flying woman? ha ha. I also found time to explore the Kashmiri mountains and later the Himalayas, and my love for the mountains in Pakistan grew so much that I returned after my contract expired to climb Spantik (7025m). During my 6 months in Pakistan some friends of mine had jumping accidents, some fatal and one miraculously survived. It made me think about my values in life, was it more important to me to follow my own adventures, or spend time with friends and family? I chose the latter, and moved home permanently. I met the love of my life, my husband to be, and moved in with him. I didn’t stop exploring and going on fun trips and expeditions, but I was more present at home. 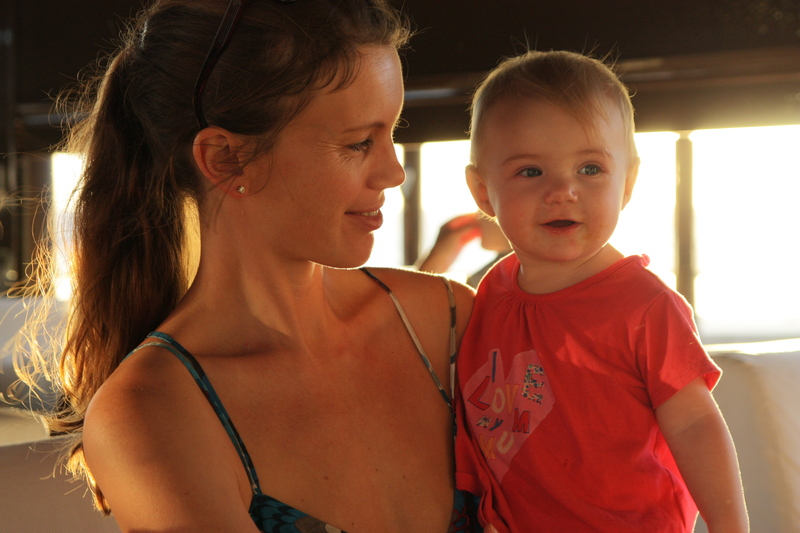 I had been practicing yoga for many years, and in 2009 I finished my 200 hours teacher training and got pregnant. And here the new story of my life starts. I gave birth to a son in 2010 and a daughter in 2012. 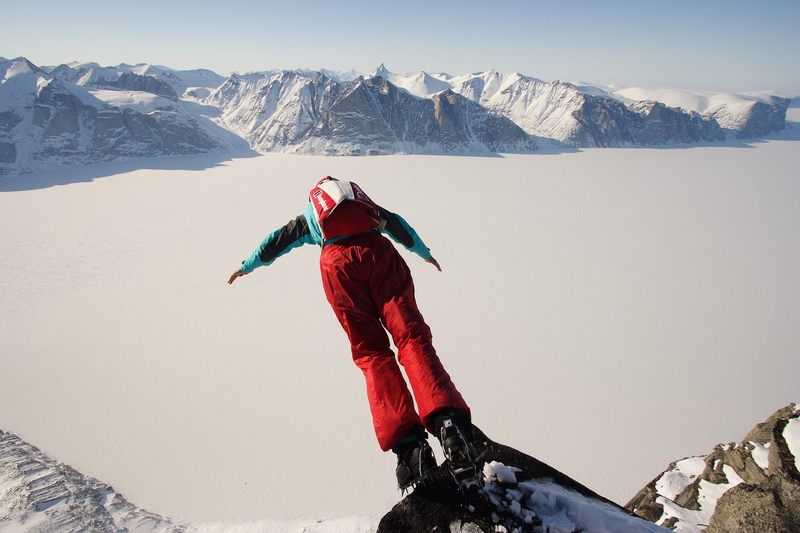 I quit base jumping due to the risk, and I more or less quit everything else in my life due to the fact that there is no time. A lot of mothers find themselves when they have kids. They love the new mommy role. I on the other hand felt like I lost myself. This blog is part of my project to try and define this new role as a mom and find a balance between motherhood and being myself. My webpage: BellyandBaby -Yoga for pregnancy and newbie mums. This is what I do for a living. 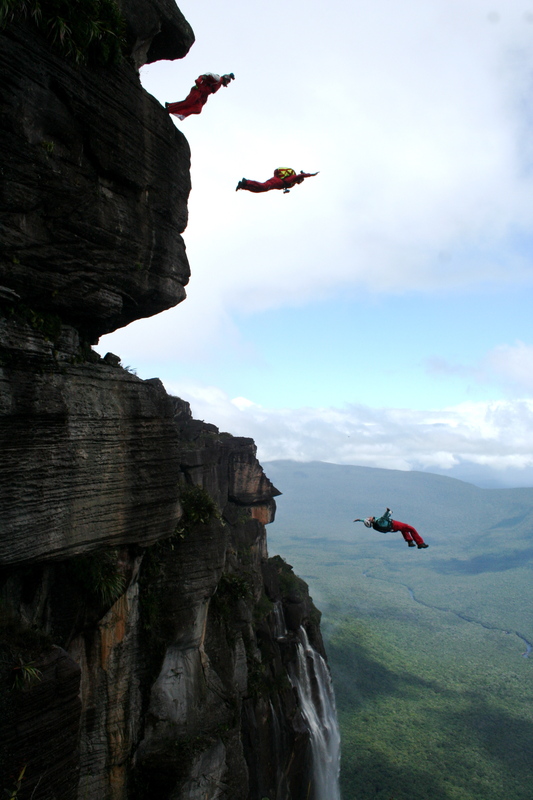 Base jumping off Angel Falls, Venezuela with my frieda Ana Dao and Livia Dickie. Hi Anniken. Thanks for looking at my Fell Running blog. It gives me lots of fresh air and exercise in some beautiful places but I’ll never get the kind of rush that you base jumpers experience. Crazy!! Interesting blog. I find your introduction very inspiring. Hi Anniken thanks for visiting my blog. What a fantastic life you have had, and you’ve only just started compared to some of us. You haven’t really lost yourself, have you. Just a period of consolidation, before the next phase? All the best. Hi Anikken… nice to meet you. Hey there! Base Jumper- turned Housewife and Mom – 🙂 WOW! Thanks for stopping by my blog, and I look forward to following you. Your life is one of the most interesting I’ve ever heard about. And, I am no spring chicken, I’m old! I hope you find what you’re looking for (ouch, I sound like U2). Thanks for your feedback on my blog. Love your story!! superwoman, no other words can describe you. I am sure your kids will be proud of you when they will grow up. good luck with “mommy role” adventures. Thanks for visiting my blog. I have been many places, and have been many things, and sometimes have even found “me” there, too. I have always seen my life as one adventure after after another. Thanks for sharing yours. Thanks for commenting:-) life is definitely an adventure:-) and traveling is a good tool for getting closer to oneself:/) have you been to Norway? We haven’t made to Norway yet. It’s on our list. Thanks for stopping by my blog for a look and also for the like on my post. Sounds like you have had a good time so far in your life. I really liked the question you posed about being a passenger or the pilot. There are too many passengers in this world. Best wishes, and I will stop back by on occasion to see what you are up to! Wow – the mountains ‘temporarily’ lost their lover. The children gained a mother. Parenthood changes us. It is one of the greatest experiences in life, AND VERY CHALLENGING TOO WHEN THEY GROW OLDER 🙂 Have fun and enjoy! Thank you for taking time to stop by and check out my blog ‘encouragement for life’ God bless you and what you do. Hi:-) The best way to get started is to follow your dream:-) We are all different, and you need to do what is right for you. But the most important thing is believing that you can do it, and work towards your goals:-) Wish you luck! Thanks for stopping by and liking one of my blogs. I appreciate the encouragement. You have an interesting story a little part adventure a little part responsibility. I’ve always found life is about honoring every part of ourselves I hope you continue to find a way to honor both the mother and the misfit in yours. Hello Anniken, thanks for dropping by my blog. I have been riveted reading about your tales of adrenaline and adventure! You must have such a rich resource of advice to offer to others – amazing. I have three kids who are all grown up now. That has also been an adventure – and not without its own adrenaline rushes…. Personally, I have always liked to keep my feet on the ground and I love long distance walking. However, I love watching programmes about people like you. My daughter’s fiance is an Officer in the Paras – he loves jumping out of planes and bungee jumping and is a total adrenaline junkie. I wish you well in this next chapter of your life…. Hi and thank you for reading my blog about Panama. You must know the area. Good luck with finding your way in your new role in life. Wow. What a life you lead, and lead it, you certainly do! Cheers to you and your goals in the next few years! Considering all of the risk taking you embrace, and your love of adventure, I’m sure you’ll find the right balance with motherhood as well! I look forward to reading more on your blog. I know you don’t “need” this but I’ve really enjoyed reading your blog and wanted to direct my readers to you. I’ve nominated you for the Sunshine Award. The details are on my blog (http://tipsyyogi.wordpress.com/2013/06/08/rays-of-sunshine/), but it’s totally up to you whether or not you want to participate. Namaste fellow yogini! Oh my….all I can say is “wow” !!! Amazing…….. nice to meet you ! Thank you for visiting my blog. It looks like you’ve lead (and currently still lead) a fascinating life. I look forward to reading your blog in the future. Hey there! I just wanted to let you know that I nominated you for the Versatile Blogger Award! You don’t have to do anything about it, but if you feel like passing it on, that’d be great too! I always look forward to reading your posts, and I hope there are many more to come! Wow Anniken!Thats a heroine material for sure! !I still remember the base jump at Abbottabad from that cable car and when you gave me that number that I might have to contact incase of injury or accident,I thought you cant be serious…and then the countdown,3,2,1 see ya! and there you went and at the same time the opening of your canopy with a snapping noise..I followed you till you landed safely and all went well!Good memories though!! !But frankly I like you being a super….mom now!Stay safe!! you have an awesome story, thanks for visiting my blog! And the same goes to you too! Hi Anniken – Greetings from Banff, Canada! I’ve been reading through your website tonight. I run a project called The Adventures in Parenthood Project (adventurousparents.com) that explores the transition of outdoor adventurers to parenthood (ie. people like you and me!). Your posts are right up my alley and you have me intrigued. I have done a lot of thinking about risk-taking as parents, so someday I’d be curious about your thoughts about how your perceptions have changed since becoming a mother. Anyways, I have subscribed to your blog (thanks for subscribing to mine!) so that I can follow along. You are great and you will be always, kisses. I like the idea behind you blog. Since becoming a mum, I feel like I’m constantly finding and losing and finding myself again! Thanks for stopping by the JoyfulParentingWEC.wordpress.com blog!